This CellML version of the model has been checked in COR and PCEnv and the model runs to replicate the results as shown in figure 4 of the published paper. The units have been checked and are consistent. This CellML description is deterministic, unlike the stochastic model created and preferred by the authors. A few equations are therefore different from the model in the Biomodels database, such as the rate equations describing the dimerisation of HSF1 and the aggregation of MisP, and the graphs produced have smooth curves since random fluctuations of the intracellular preocesses are not taken into account. ABSTRACT: Many molecular chaperones are also known as heat shock proteins because they are synthesised in increased amounts after brief exposure of cells to elevated temperatures. They have many cellular functions and are involved in the folding of nascent proteins, the re-folding of denatured proteins, the prevention of protein aggregation, and assisting the targeting of proteins for degradation by the proteasome and lysosomes. They also have a role in apoptosis and are involved in modulating signals for immune and inflammatory responses. Stress-induced transcription of heat shock proteins requires the activation of heat shock factor (HSF). 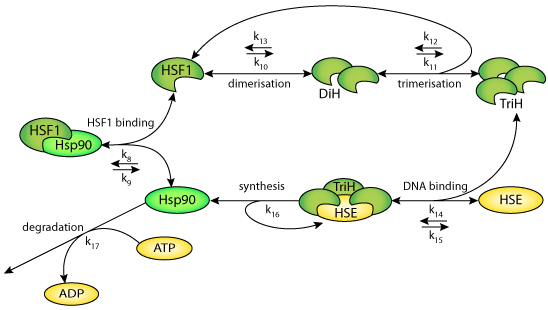 Under normal conditions, HSF is bound to heat shock proteins resulting in feedback repression. 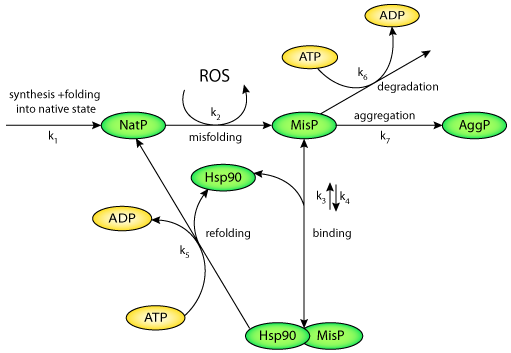 During stress, cellular proteins undergo denaturation and sequester heat shock proteins bound to HSF, which is then able to become transcriptionally active. The induction of heat shock proteins is impaired with age and there is also a decline in chaperone function. Aberrant/damaged proteins accumulate with age and are implicated in several important age-related conditions (e.g. Alzheimers disease, Parkinsons disease, and cataract). Therefore, the balance between damaged proteins and available free chaperones may be greatly disturbed during ageing. We have developed a mathematical model to describe the heat shock system. Derived from workspace Proctor, 2005 at changeset 49bd8537d6b6.